Taco Soup Recipe! This quick and easy Taco Soup Recipe can be made in the slow cooker or right on the stovetop. 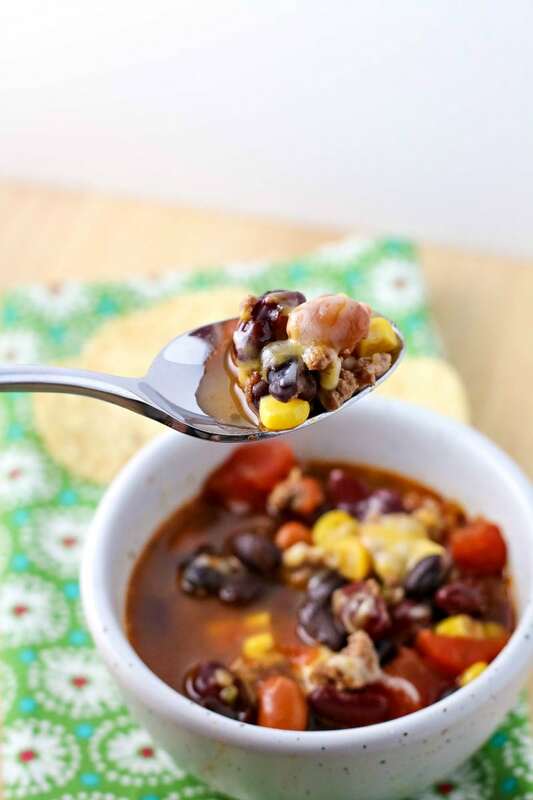 Ready in no time, this taco soup is filled with ground beef, beans, corn and taco seasoning. 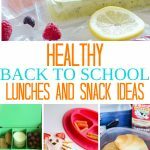 It’s a quick dinner that everyone loves! As the temperature drops, I like to bring out all the soup recipes I can find! 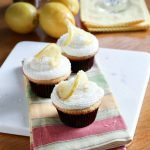 Some of my favorites are Homemade Chicken Noodle Soup, Butternut Squash and this…. This low-fat, hearty soup is full of flavor is perfect for cold nights. Even the kids love it! Slow cooker soup recipes are the best for busy nights! 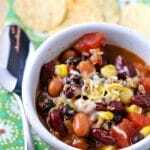 Full of easy to find and affordable soup ingredients like hamburger, beans, corn, tomatoes, taco seasoning and ranch dressing seasoning – this soup packs a big flavor punch that will warm you up right away! Just add all of your ingredients to a slow cooker or dutch oven on the stovetop, heat and serve! That’s it! 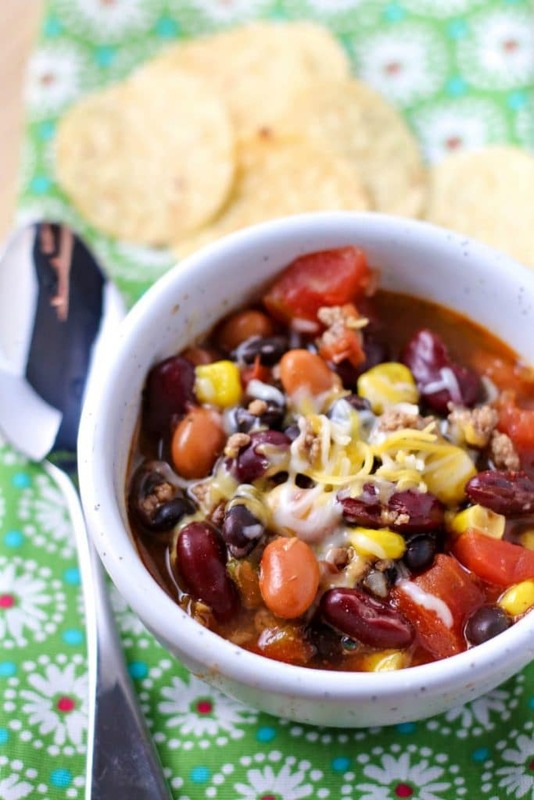 What Toppings Do You Add To Taco Soup? I like to top my soup with shredded cheese, sour cream, tortilla chips and cilantro – yum! But you can just leave it plain like my husband does. Whatever you like is perfectly fine! Make sure to add LOTS of toppings to your Taco Soup. It sure makes it delicious! We like to add tortilla ships and bread to the side to eat with our soup. Hotdogs are also a good choice for the kids! Making this soup ahead of time in the slow cooker is perfect for busy days. All you need to do is brown the hamburger in a skillet and then add all of the ingredients to a slow cooker to simmer. As an alternative, you can leave this Taco Soup on the stove in a dutch oven . It’s up to you! Just make sure to cook for about an hour or more to let all the flavors mingle together for a big bowl of yummy goodness! 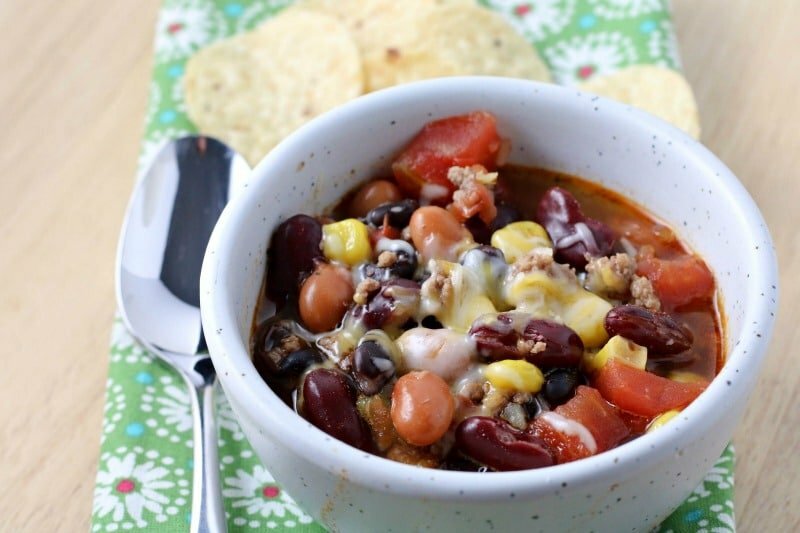 Try this Slow Cooker Taco Soup Recipe out soon, I promise you’ll love it! Add meat to slow cooker and add in ranch dressing and taco seasoning into meat. Add all of the remaining ingredients to the slow cooker and stir. Fill with water until the water just covers the ingredients. Cover and cook on high heat for 1-3 hours. Can also be made on the stove top and simmered for 1 hour. Serve topped with shredded cheese, sour cream and corn chips - if desired. Here’s a quick how-to make taco soup video! I’ll have one coming out soon from All Things Mamma! 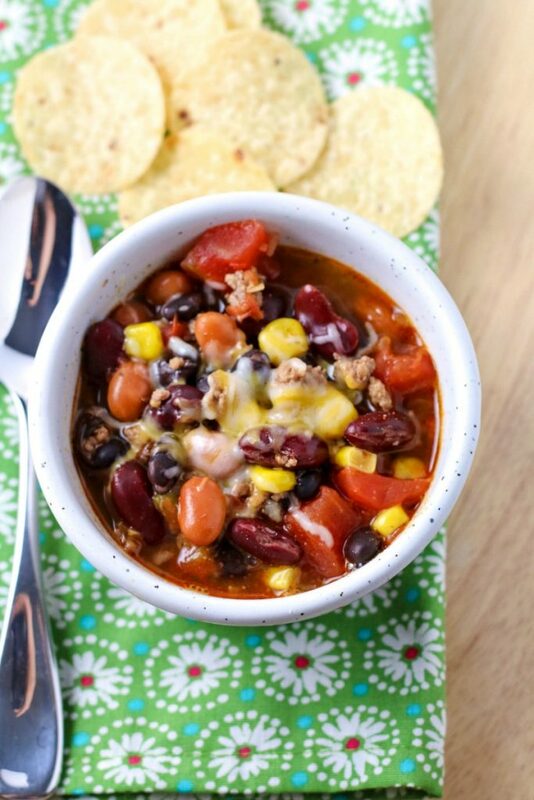 Here’s a GREAT image to pin of this Slow Cooker Taco Soup to save for later! Try these slow cooker recipes next! I make this! I make it with ground turkey though – we have this all the time in the colder months. It’s one of the things I look forward to the most when the snow starts flying! I’ve printed this up and will make it sometime this week! That looks delicious! Thanks. I need some new recipes. Ooooh yummy! That looks so good. OH so yummy that looks delicious! Guess what I’m eating right now! I made this last night for dinner (I’m having some leftovers for lunch) and it was a complete HIT! Even with my boys who generally are hit and miss with dinners!! 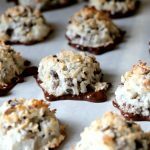 I will definitely be making this again and again and again! OH YAY, Nicole! I am soooo glad you like it! 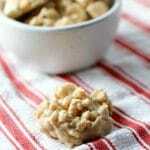 It is really yummy and low-fat – well, before you add the cheese, sour cream and chips! haha! I’m glad your boys enjoyed it as well! Thank you for letting me know!! This sounds fantastic! I can’t wait until my gallbladder is out so I can try it! Yum we do a similar taco soup. Can’t wait for winter comfort foods! Taco soup is one of my husband’s very favorite things and I don’t make it nearly enough, so he’s very excited about this delicious recipe! You have me craving fall and curling up by the fire with a bowl of this soup! !